The first round of the Golf Road Warriors – French Lick Resort extravaganza was played, fittingly, on the Donald Ross Course. The course, in a rural setting, is located three miles from the West Baden Hotel, where we’re staying. One can only imagine what the region was like in 1917, the year Ross designed the course (it opened three years later). Of all the Golden Age architects, Ross may have been the best at utilizing the existing landscape and harnessing natural contours to his purposes. After scouting the area and personally selecting the hilltop site, which has a thickly wooded border and a few interior trees, Ross set about doing what he did best: Extracting understated yet inherently dramatic holes from the land with only basic earthmoving equipment at his disposal. Maybe the Midwest isn’t so flat after all. The terrain was quite a bit hillier than we were expecting. 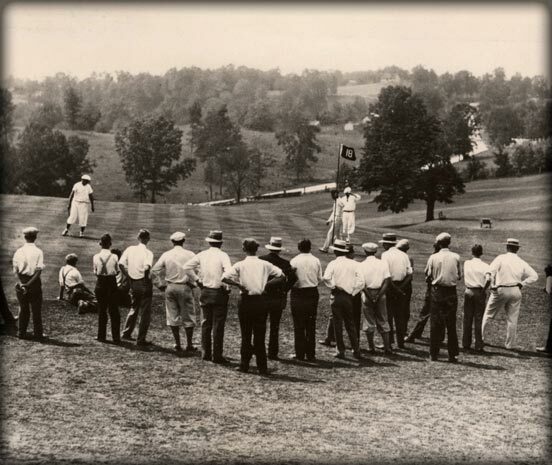 Back when Walter Hagen captured the 1924 PGA Championship at French Lick with a 2-up victory over “Long Jim” Barnes (who struggled on the sloping greens), the Hill Course, as it was then known, must have presented a daunting test given the equipment in use at the time. The first hole, a sturdy par 4, sets the tone for the round. The tee is elevated. The broad, inviting fairway drops over 80 feet into a valley. The green beckons from a hilltop, asking for your best. It is a theme repeated throughout the round, but it never gets old, because the bunker placements, green contours, shifting winds and general prospect of each hole are never the same twice. There’s a nice little Donald Ross tribute in the cart staging area, a metal sign planted in a flowerbed. It reads, “An ideal golf course is a test for both the expert and the everyday player. It is my goal to bring out of the player the best golf they have in them. Golf should be a pleasure, not a penance.” To which I say, it depends on what tees you play. We chose the Ross (bronze) tees at 6,517 yards (par 72). Given the wetness of the course (more about that in a minute), the holes played much longer than the listed yardage. And yet it was pleasurable, even if we couldn’t reach some of the longer holes in regulation. It’s important to remember on a vintage track like the Donald Ross Course that the game a century ago was all about match play, not medal play. How else can you account for a trio of par 3’s listed at 194, 210, and 228 yards from the bronze tees? Each of these holes followed the peak-to-peak playbook, with the green sited well above tee level. I hit driver at each of them and was happy to get near (but not on) the green. Only at the relatively short par-3 16th were we able to play our tee shots with irons. 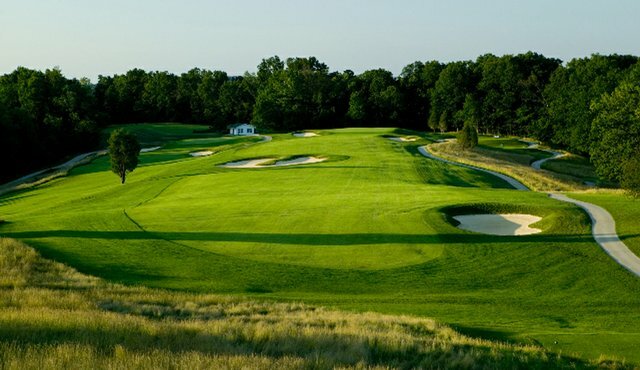 Among the feature holes on the front nine is the par-4 eighth, a right-to-left dogleg that calls for a bold approach over a deep valley to a large, squared-off, bunkerless green traversed by a three-foot ridge. The putting surface falls nine feet from back to front. Get above the hole here, and you’re in for a putting adventure. The bronze tees were fairly close to the Medal (gold) tees except at the par-5 15th, which stretches to 665 yards from the tips. “I don’t take vacations that long,” was veteran warrior Jeff Wallach’s quip about a hole that approximated an overland journey from the waybacks. As on all of Ross’s better courses, ones where he actually spent time, the holes here fit together beautifully. There isn’t a clinker in the bunch. You need to play smart, solid shots in return for par, you need to cope with sidehill lies, but you’re never overmatched. Unless you squirt one sideways. Then your ball vanishes in thick, matted fescue grasses that should be trimmed back to speed play and avoid golfer frustration. The layout, treated to an extensive $4.6 million restoration in 2006 in conjunction with the Donald Ross Society, is like viewing a faded sepia-tone photograph that’s been brought into clearer focus. The makeover included a new irrigation system, but the superintendent needs to use water more sparingly. The course, despite its splendor, was too soggy. The “firm, fast conditions” memo issued by the game’s ruling bodies in the interests of water conservation needs to be honored. Ross’s ingenious ground contours were meant to be dry and firm. Too much water negates their purpose. On the plus side, Lee Schmidt, who performed the restoration, had plenty of guidance. Outside the men’s locker room on the bottom floor of the clubhouse are framed reproductions of the original Ross drawings for the course. Ross, listed as “architect and engineer” on the plans, drew each hole on a grid, with meticulous instructions in the margins devoted to green contours, bunker grades, tee configurations and tree removal. The Scotsman left nothing to chance. His intentions are clearly expressed in minute detail. Schmidt stretched the course to 7,030 yards to challenge scratch players, but spent his time carefully restoring the original green shapes and contours and refurbishing the distinctive grass-faced, flat-bottomed bunkers. There are flashier, newer courses across the land, but very view with the time-honored virtues of the Donald Ross Course at French Lick. It’s a classic. Brian was Senior Editor at GOLF Magazine for 16 years and is the author of three golf/travel books for Harry N. Abrams: Golf's Best New Destinations (2006), Top 100 Courses You Can Play (1999), and Golf Resorts of the World (1993).